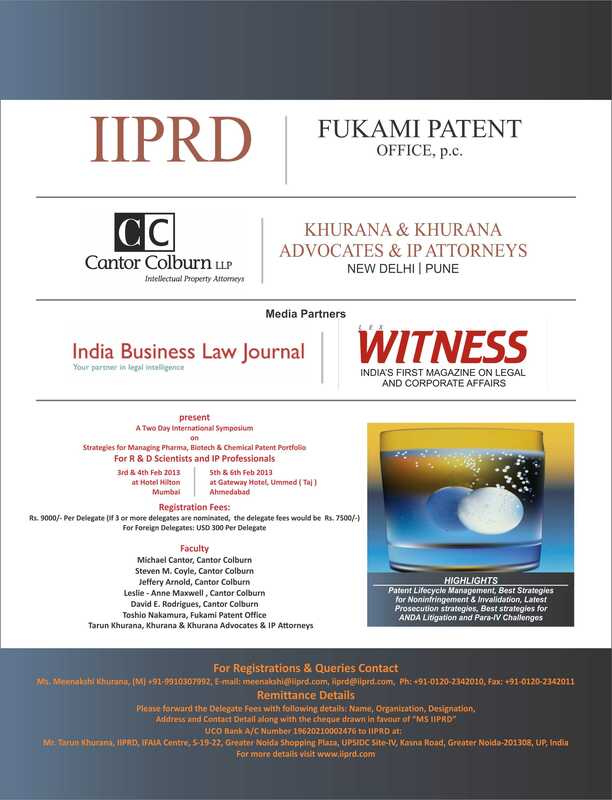 We are happy to inform you all that IIPRD and Khurana & Khurana, in association with Cantor Colburn (US) and Fukami Patent Office (Japan) are holding an International Patent Symposium covering all major and relevant Pharmaceutical/Biotechnology Related Patent issues in the month of February, 2014 in India. The Two-Days International Symposium would be covering Strategies for Managing Pharma, Biotech & Chemical Patent Portfolios in US, Japan & India and is being held from 3′rd-4’th February 2014 at Hotel Hilton, Mumbai and 5’th-6’th February 2014 at The Gateway Hotel Ummed, Ahmedabad. Mr. Tarun Khurana, Partner at Khurana & Khurana, Advocates and IP Attorneys, India. Please see the complete details including Program Schedule, Topics, Speakers Profiles etc. in a brochure available over here .